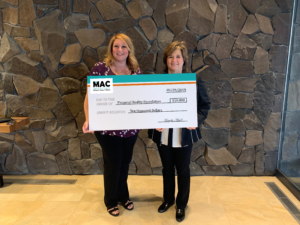 Fairbanks, Alaska, April 1, 2019 – MAC FCU presented a check for $10,000 to the Financial Reality Foundation. The Get REAL Financial Reality Fair, a program provided by the Financial Reality Foundation, is an interactive program that allows students to make budgeting decisions (and mistakes) in a fun-filled, interactive learning environment. The event is a two-hour simulation, specifically designed for high school seniors where they make real-life choices about a post-high school career and how to stay within budget while paying for necessities such as housing, food, and transportation to name a few. Along the way, needs versus wants are tested as community volunteers sell vacations, puppies, hot tubs and many more impulse spending items that can have a major impact on a budget. The Financial Reality Foundation partners with local credit unions like MAC Federal Credit Union, providing them with a turn-key reality fair package that makes it possible for the credit union to host these fairs at local high schools. In a collaborative effort, the foundation and credit unions work with their own staff and community partners to provide the event for students in their own schools, during their school day. The concept of using community volunteers and school resources has been highly successful. It reduces costs and meets students where they are. It ensures a better turnout and their minds are receptive to learning. Budgeting is a topic most relevant to high school seniors at this stage of their life, making real-life application foreseeable. By providing the Get REAL Financial Reality Fair program to the schools annually, every student will get an opportunity to participate when they become a senior. It creates an eagerness for lowerclassman to go through this eye-opening event in their future. “MAC Federal Credit Union wholeheartedly believes in the mission of people helping people and is excited to be a part of the Financial Reality Foundation’s Get REAL program for students in Alaska. We believe this important program expands accessibility to our youth by providing innovative and real-life financial education training that is so desperately needed in our communities. In return, students enter adulthood with a much better grasp on the challenges that lie ahead and have the necessary tools to adapt and succeed,” said CEO Angela Head of MAC FCU. MAC Federal Credit Union has been providing the Get REAL Financial Reality Fairs to schools in the Fairbanks, North Pole, and Delta Junction areas since 2015. Nearly 700 students have graduated with the revelation of budgeting, the importance of savings, and balancing their wants vs. needs. The Army Emergency Relief Fund has a mission to provide emergency aid to the US Army soldiers and their dependents, in the form of a direct grant, or as an interest-free loan. They also give college scholarships to children of soldiers. 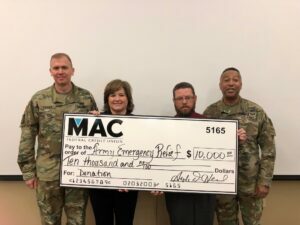 With a 66-year history supporting the Fort Wainwright Community, it is no surprise that MAC Federal Credit Union would jump at the opportunity to help fund 2019’s AER fundraising campaign. MAC has an average 20% employment rate of either retired military or active military dependents. That being the case, there are many personal stories of how the Army Emergency Relief Fund has helped those here at MAC over the years. CEO, Ms. Angela Head is a former soldier. During her time in the service, an unexpected death of a family member occurred. Without the support of the AERF she would not have been able to travel to be with her family during that difficult time. MAC has a high commitment level to its members and the community. While MAC is open to membership within the entire Fairbanks North Star Borough, we are extremely proud of our history of serving the military. With regard to our service members and their families, MAC continues to focus on the importance of financial readiness and helping build financial wellness leading to financial success. 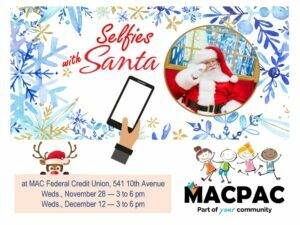 We invite all of our MAC Members to come and take a Selfie with Santa. Santa will be visiting the 10th Ave branch on Wednesday, November 28, 2018, and Wednesday, December 12, 2018, from 3:00 pm to 6:00 pm. Come and share with Santa what is on your Christmas Wish List. Be sure to bring your phone and share your Selfie @macfcu #santaselfiefbks on Instagram for a chance to win prizes! Prizes will be announced after December 12, 2018. Check out our FB event and let us know if you are coming. 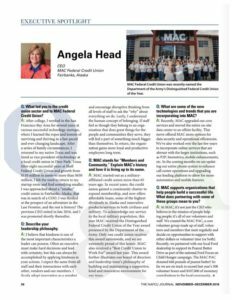 MAC FCU’s CEO Ms. Angela Head was recently featured in an Executive Spotlight for The NAFCU Journal. NAFCU stands for National Association of Federally-Insured Credit Unions. MAC is so proud to have Ms. Head as our CEO, and we wanted to share with our Members her accomplishment and what that means for MAC! 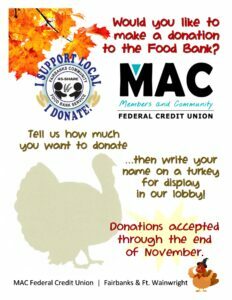 ask about how you can help feed a family this Thanksgiving.